Here’s an awesome app called Cocktail Flow. 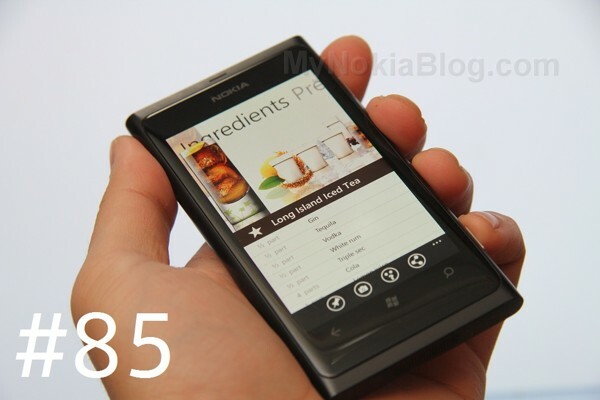 We heard about this back at Nokia World from Edward Umana who shared this app with us during breakfast. You can get a trial/free version but it is completely worth it downloading the app as it’s very polished and rather impressive. Anyway, Cocktail flow is a cocktail recipe app that is just brilliantly put together. The app works wonders with the Metro panoramic style. This is just a great example of how to take advantage of Metro. In the first ‘page’ you can browse cocktails from the list, by category, a random cocktail and you can even download packages (for free) that contain themed cocktails, (e.g. non alcoholic, valentines, st patricks, Superbowl etc). Swipe over to the right and you can browse based on what you have in your cabinet. You can click on ingredients which are grouped into spirits, liqueurs and mixers (and arranged as if they were on a cabinet). Tapping lights up the black and white ingredients into full colour. Swiping eventually leads you to ‘my bar’ which shows what you can make. There’s an indicator in the top right corner that tells you how many cocktails you can make. I was actually at an event last week where we the cocktail was made with this app. Now when you click on a cocktail you can see a picture not only of the cocktail so you know what to expect but the ingredients as well. Not only that, you can tilt the phone and you’ll notice a kind of parallax movement as objects in the foreground move more than those at the back. It’s pretty cool. Under the name is the ingredients list, and swiping over tells you how to prepare it (with clear icons as well to reinforce the instruction). There’s even a neat community feature where you can see user submitted photos and reviews and submit your own. Particularly useful is the ‘Similar’ section so if you like a certain drink, you have plenty more to try that you might also like. Other things to mention include the shopping portion where you are recommended ingredients (which also quite conveniently has price tags on them). I didn’t show this in the video but to favourite a cocktail you just tap the star next to the name. You can then browse favourites in the favourites section. You can also pin cocktails as tiles. This app doesn’t end there. It has a Guides section that gives you some tips on getting started, barware, and garnishes. The app has push notification options when you set it as a live tile. If there’s anything you’re not sure about, check the app guide. Overall, a brilliant app. It’s the first I’m giving 10/10 to in all categories. It looks great, it’s really simple to use, it performs great and is so much value for money. Happy Holidays with the Festive and New Years cocktail packages! Browse, find and discover cocktails with a continously growing collection of drinks. The application features beautifully presented recipes and identifies cocktails that can be made from ingredients in your bar. It also gives suggestions on what ingredients to buy next to make additional delicious cocktails. The application is regularly updated with new cocktail recipes, the latest ones added include several themed drinks.